I’ve been a volunteer for Operation Orphan for the past few years. I held a successful fundraising event in March 2015, I’ve collected winter clothing and helped with the charity’s packing week in Nottingham every year for the past three years. Packing week takes place at the end of July and it is when all the donated winter clothing collected for Operation Orphan’s Keep a Child Warm Initiative is sorted and packed in Chilwell Sixth Form College, before being sent abroad to be distributed to children in Eastern Europe in October. In 2013 I actually joined a team in Romania as part of the Keep a Child Warm distribution that year. We gave out warm winter clothing and even held a fun day for the children at the orphanage. I weighed and recorded every box in this photo! Just before the summer this year Operation Orphan was contacted by National Citizen Service (NCS), a programme run for 15 to 17 year olds, to ask if some NCS teams could volunteer for the charity. My first experience of working with NCS participants was on the Wednesday evening of packing week. After a full day of sorting, packing and weighing boxes at Chilwell Sixth Form, I headed down to the Operation Orphan warehouse to continue bagging and boxing clothes to send to Sierra Leone. 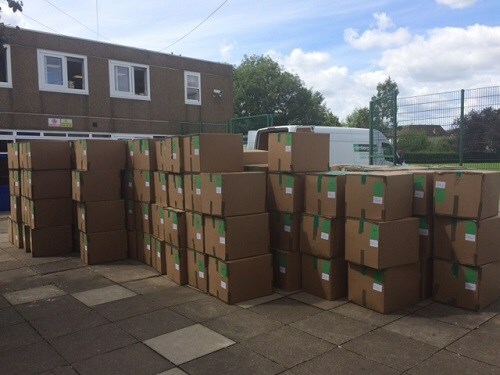 We were then able to clear space in the warehouse ready to receive the 700 plus boxes that had been packed at the sixth form college. Despite only working alongside this NCS team for a couple of hours, the team were really great to work with and much was achieved! After arriving back home after packing week, I received a message from Operation Orphan’s director, Cyrilyn, to say that there was an opportunity for me to oversee any NCS teams who wished to support Operation Orphan. These young people could choose to raise awareness of the charity, fundraise and/or volunteer for the charity. My voluntary work for Operation Orphan has involved informing NCS teams of the work Operation Orphan does and empowering these young people to promote the charity’s work. Some of the ways the NCS teams have helped the charity is by packing boxes of winter clothing, distributing Operation Orphan newsletters to local businesses and handing out Operation Orphan flyers in and around Nottingham. Over the past couple of weeks, as a representative of Operation Orphan, I have attended fundraising events organised and managed by some NCS teams. I have really enjoyed working alongside these diverse teams of young people and have been amazed by how much they have been able to do for the charity in such a short space of time! I also had an invitation to give a talk to a group of NCS participants at Nottingham University about the work of Operation Orphan. The talk informed the young people of how the charity helps to strengthen the care structure of orphans and vulnerable children by keeping them warm, safe, healthy and learning. I love being able to share with others the valuable work Operation Orphan is doing! Thank you so much to all the teams who have helped to raise awareness of the charity’s work and helped raise funds to support orphans and vulnerable children across the world. I am grateful for the opportunity I have had this summer to be a part of the Operation Orphan team, and it doesn’t end here. Next week (9th September) I am holding my second quiz night in Cambridge! Click here for more info.